I interrupt this list for an important note; If you're looking for package bees and everyone's sold out (should be no surprise – it is February after all) then I highly recommend a Grampa's Gourmet nuc. Check out Brent's website. I especially like his note on buying bees where he says, "[the road] to beekeeping is long … one that many people have ventured down rather uninformed, misinformed or without a steering wheel all together." I could've titled this post #GoodToKnow: Langstroth-style beekeepers are to Top Bar Hivers as mountain bikers are to roadies: haters. Well, maybe that's a bit extreme, but more often than not it's a dichotomous relationship. You only need to attend one bee club meeting to find a Langstroth style beekeeper that will look at you like you're from another planet because you chose a Top Bar Hive. But I do encourage you to go to one because a good relationship with a beekeeping mentor will take your beekeeping to the next level quickly. Brent Edelen suggests finding a mentor with 3 years experience, but I must add that you need to find one using the same style hive as you are; if you're using TBH find a TBH mentor. If you're using Warré find a Warré mentor. If you're going to be taking someone's advice, you need it to be relevant. The answer to, "How do I feed my bees fondant in Winter?" is different for a Top Bar Hiver than a Warré or Langstroth Hiver. The answer is not just logistical in nature; more important is the philosophical aspect. When it comes to bee/hive management, you're going to need someone that shares your view on not just how to feed, but whether to feed at all. Or to treat, to drone trap, pinch a queen… to help you with all the hard decisions so you can just get on with the business of keeping bees. Make sure to ask you mentor candidate what their philosophies are. As silly as it may seem, this is where the Mason Jar Philosophy comes into play. Some beekeepers put their honey only in glass and they use mason jars because they're maker-ish or something. I prefer glass too, but I have an issue with mason jars being used for honey. Mason jars and two-piece lids are for jelly and jam-making. If you're not "putting up" your honey, why on Earth would you use a mason jar? While jar style might not be the yard-stick to measure a mentor with, you need something to go by when looking for a mentor that believes the same things you do. So go ahead and find a beekeeper using the same style hive as you've chosen, and ask them what their mason jar philosophy is. This kind of goes without saying; make sure that they're local. If your question is, "When do the Silver Maples start flowing in Denver; Can I stop feeding?" you want a Denver beekeeper to answer. The answer, by the way, is NOW and, "That Depends." Attend a local bee club meeting or two, specifically to find a mentor. There aren't a lot of seasoned TBH or Warré-style beekeepers, so be prepared for a reality where you're simply on your own. #GoodToKnow: how to make your own jams, jellies and butters. A good beekeeper is self-sufficient. "If you ask 10 beekeepers a question, you'll get 12 answers," is true. Trouble is, not all 12 answers are going to be good. Sometimes it's more confusing when you ask someone else their opinion. Often the best answer will come from within, if you ask yourself one simple question. "What do my bees need?" Always put the bees needs before your own, think through how to work smarter not harder, and you'll do well. 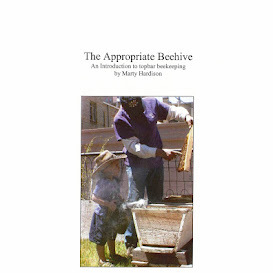 A few quality beekeeping books on your shelves will help. Here's a couple that I like. What is your opinion on using new glass every time you bottle honey? I know some beekeepers who are adamant that you should use new glass each time. I understand you don't want a used jar that once had pickles in it, but I don't see the harm of using jars that have been used for honey before. For myself, I kind of like mason jars because I always have a bunch on-hand. But I use plastic caps for honey -- or any other canned item that's just been opened. Those 2-piece lids are a complete pain for anything other than canning. I do like your point, though, about finding a mentor who not only shares your hive type, but your philosophy/approach to beekeeping as well. It's really important to find someone who is successfully doing what you're trying to achieve. Otherwise, you'll just get a bunch of conflicting and confusing information that will keep you second-guessing all the time. If only the plastic lids were prettier, right @Julie D? I even gave those to the beekeeper I mentioned. He was thrilled because I also gave him wide-mouth jars, which I will admit are nice for chunk honey. I am glad that you mentioned finding someone who is "successfully" doing what you are trying to achieve. I had that in my early drafts but rewrote this post so many times, this important point got lost. There is no point in choosing a mentor that has not overwintered her/his colonies… that is how I measure success… because if they are simply restocking every spring, then their methods are not good ones to mimic. IMO if a beekeeper successfully overwinters their colonies, then what they did allI the year before must have been good for the bees. Of course, there are lots of reasons for winter losses, but I firmly believe that most can be prevented if only the beekeeper didn't do X or did do Y. BTW I really like what you are doing over in your apiary. I would pick you as my mentor if I lived nearby. Amen. Keeping one hive alive for 5 years is a way different story than keeping 5 hives for 1 year each.